Q. What is the astralight stone effect? A. Astralight is available on both smooth and faceted stones. Astralight is a special effect under the stone that gives the illusion of a rainbow beneath the stone. Q. What is the sundance stone effect? A. Sundance is available on both smooth and faceted stones. Sundance is a special effect under the stone that gives the illusion of rays beneath the stone. Q. What is an encrusting? A. This special option is a white or yellow metal that is embedded into the top of your stone. You have the option of choosing a symbol or a personal letter. If you choose a personal letter you can choose two lettering options: Block or Old English. TIP: Encrustings look best on dark stones. Sundance and astralight stone effects are not available if you choose an encrusting. Encrustings are available on smooth stones only. Q. What is a protected emblem? Q. What stone colors are available? A. There are 15 simulated stone colors available: Garnet, Amethyst Spinel, Aquamarine, White Spinel, Shamrock Spinel, Alexandrite, Ruby, Peridot, Fire Blue Spinel, Rose Zircon, Topaz, Blue Zircon, Hyacinth, Blue Spinel, Tourmaline. Two semi-precious gems are also available, Mother of Pearl and Black Onyx, these two stone colors are available in smooth stones only. Q. What is a karat? A. A karat is a measure of gold content in the jewelry material. Gold is a precious metal that is a wise investment due to it's durability and lasting value over time. Pure gold is 24k, 18K is 75% pure gold, 25% metal alloy; 14K is 58.5% pure gold, 41.5% metal alloy; 10K is 41.7% pure gold, 58.3% metal alloy. Gold comes in two colors, white* or yellow. A. A metal alloy composed of 17% gold, 21% silver, and 62% other metals. A. A precious metal alloy primarily composed of silver with elements of paladium and gold. This metal quality is coated with rhodium plating. Q. What is white Lazon®? A. White Lazon® is a durable and brilliant white metal at an affordable price. Q. What is yellow Lazon®? A. Yellow Lazon® is a durable and brilliant yellow metal at an affordable price. Plated with 23K gold. *Note: Nickel is included in the following metal mixes; white Lazon®, yellow Lazon® and all white gold. Q. What is Antique Finish? A. This traditional finish provides contrast which accents the fine detail of your ring with a dark background. Q. What is Brilliant Finish? A. Brilliant finish is available on gold, AmberXT® and SilverXT� rings only and provides a high polish look. Q. How should I personalize my ring? Q. What is a bezel? A. 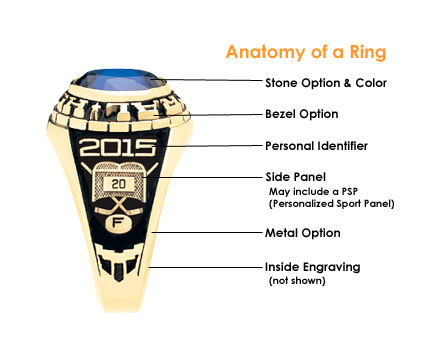 A bezel is the area around the stone for your high school name. Two other bezel alternatives are available: home school or a decorative laurel leaf, ask your local retailer for more information. Q. What side panels are available to me? Gold Lance provides you with Any Ring - Any Panel. All of the side panel options you see on goldlance.com are available on the following ring designs from the Classic and Retro collections: Insignia, Hallmark, Dunkirk, Royal Scepter, MVP, Explorer, Superstar, Canto, Genii, Sahar, Alecto, Elegance, Antique, Tiara, Primrose and Prism. Q. What is a PSP (Personalized Sport Panel)? A. Some sports panels offer a Personalized Sport Panel. This feature allows you to add your jersey number and team position. A great way to add that personal touch! Q. How do I find pricing? A. Please contact your local jeweler for pricing. Q. What is the Gold Lance Warranty? A. Please see the Gold Lance lifetime limited warranty pages. Q. What is the Jewelry Protection Plan? A. Gold Lance will automatically protect your Gold, SilverXT® and AmberXT® ring or tag from loss or theft for a period of four (4) years from your date of purchase of said ring or tag. See further details at Gold Lance Warranty. Q. How do I file a claim if my ring gets lost or stolen? STEP 1: Contact Gold Lance by calling 1-800-252-5777. Please have the following information available before calling Customer Service: store name and location of your original ring purchase, your name and address information and have a credit card available to charge the replacement fee plus handling fee and if applicable, your local sales tax. STEP 2: Place your new ring order with the Customer Service Representative. Q. How do I find a retailer close to my location? A. Visit our Where to Shop page and locate the dealer nearest you. Q. What if there is not a retailer close to my location? A. Please contact Gold Lance customer service area to help in directing you to your closest retailer at 1-800-252-5777. Q. How do I become a Gold Lance dealer? A. Please contact Gold Lance customer service area who will direct you to the appropriate Account Manager at 1-800-252-5777.